Some one did a count and apparently Boston has the highest number of bloggers in the USA. At least that's what I heard on the radio. Seems odd that it would beat out places like New York and San Francisco. Way to go Beantown Bloggers! The only digiscrapper I know who is for sure a Boston scrapper is Mary Canavan but I'm sure there are more. I'm not sure I qualify although Boston is my home town and I live just 40 minutes north. Somehow that state line changes everything - New Hampshire is quite different from Massachusetts. Must be the water. Now there a list of Granite State bloggers...ah-yuh, I'm there! The vendors got sneak peaks yesterday and I was blown away! Scrap-A-Faire is amazing and adorable and there is a wealth of information for scrapbookers and any one who wants to learn about scrapbooking. The booths are all virtual and interactive which is really cool. The booth designs are particularly cute! Each booth had areas for you to shop, pick up information, watch demos, chat - all the things you would normally do at a show but you don't have to leave your house! Given the weather recently that is a very good thing! Both digital and paper scrapbooking is covered so there is something for everyone. Just check out the list of Exhibitors. And I know a few like Scrapdish didn't make the list on the website so you never know who you might run into there. Register now because it starts tomorrow!! And don't forget to stop by the FxFoto booth and say hello! Well, it's time once again to update the digital scrapbooking kits that come with FxFoto Creative Edition and we need your help since none of us are designers! (At least not yet!) I'm posting this today so my faithful readers can get a head-start. And if you would like to be added to our Designer Call email list please let me know at susan.white@triscape.com - I promise no spam, no list selling or sharing and I only use it for calls. So I am looking for kits which cover many of the events users might want to scrap - things like Baby, Boy, Girl, Holiday, School, Guy, Wedding/Love, Heritage and kits that could over the four seasons. Sort of general purpose kits. We just want a variety so users can try digiscrapping, get hooked and then go buy your kits. :-) If you're not sure your kits fits, just send it anyway! Would you like to be on our Designer Call email list? Those on the list received an email from me earlier this week and I'd be happy to add you to the list. Just email me at susan.white@triscape.com and I'll add you. I promise no spam, no list selling or sharing and I only use it for calls. I can't wait to see your stuff! Feel free to email me if you have any questions! 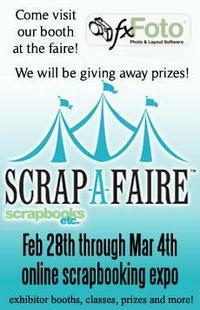 Scrap-A-Faire is just like a real show so you can go from booth to booth. Each booth has click-able areas so you can learn about products, see presentations, watch videos and check out everything. There is even chatting in the booth so you can ask questions. I got to see the Scrapbooks Etc booth which has a cool video with Melissa Inman. It looks like they are going to have a behind the scenes video too which should be fun. The Scrap-A-Faire will also have a big lounge for everyone to stop by - bring you favorite beverage and munchies - and everyone at the show can chat with each other. There's a big gallery too plus classes. You can register to attend and it only costs $5.00 which is probably less than you'd pay for parking at a live show. Two Peas in a Bucket is offering free admission with a $25 purchase from their store so that might be worth checking out! You can take a tour on the Scrap-A-Faire site too. See you there! I'm on the air! Or on your iPod! You don't need an iPod to hear the show. It will play on your computer too! Come join Donna Pelletier and I for a chat about FxFoto at Scrap Outside The Box www.scrapoutsidethebox.com on this Thursday Aug 31 at 9 pn EST. We'll be chatting and answering questions about FxFoto and the new v 4.0 You don't have to be a digital scrapbooker to join in. Come if you're curious or are just beginning to digiscrap - really everyone is welcome! Donna is the new site owner of Scrap Outside the Box, a designer and loves to digiscrap (when she has the time LOL)! We will be giving away some prizes too - a copy of FxFoto Creative Edition and some gift certificates and who knows what else? Looking forward to seeing you there! FxFoto v 4.0 is here!!! Yes, indeed, v 4.0 of FxFoto is up and running and ready for you to download. Yeah!! This is a big upgrade which was months in the making for our programming department and it has loads of new stuff. If you are already a customer, then you are, as always, entitled to a free upgrade for your FxFoto. Really! Enjoy! And pass the word on to your friends, co-workers, relatives and the new neighbors next door. And feel to post on message boards, blogs and websites! You get the picture - we love your support. How do you get v 4.0 ? The new version will install over your old version so do not un-install your FxFoto. Go to FxFoto Download and click on the download button. Now click on Run when the first dialog box comes up and just follow the instructions. 3D effects - "Colored 3D", "Metallic 3D", "Translucent 3D" and "Image 3D Shading"
Colored filter effects - "Bleach", "Winter Dull", "Spring Greens", "Summer Blues" and "Autumn Reds"
Additional crop shapes - "Stamp", "Sailboat", "Porpoise", "Music Note" and "Tabbed File Cards"
New Matte files can save Glue Groups and add them back to collages as one step. And you can save as a Transparent PNG file to make your own tags and elements. Color brush now has a "Get Color at Picture Click Point"
You will also find user and reviewer comments scattered throughout the website. And we still have a long and quite complete list of comments under Reviews and Awards. If you would like to add some of your own, feel free to email me at seswhite@gmail.com . We love hearing from you! the name of the kits you used and the designer name of each kit (so we can give credit to them too) You can use any kit! the name of the fonts you used.